Stomach—a major organ of the digestive system—acts just as the fuel factory for your body. It assists in the breakdown of large chunks of food into sufficiently smaller particles that can easily be absorbed into the blood stream for energy extraction. Any disturbance or malfunctioning in this part of the body means the fuel supply to the remaining parts is going to be cut off, thus severely affecting the overall functioning of the body. So, if you want to remain healthy, active, fit, smart and energetic, it is essential to take special care of this organ. The medical researchers have identified dozens of conditions that affect the structure and functioning of the large elastic pouch in the abdomen, called stomach. Some are mild while others may be very painful and severely affect your routine life. The first and foremost requirement for keeping yourself away from the stomach disorders is to get sound awareness about such conditions. How can you cope with a danger when you have no idea about it? If you are committed to avert any possible disorder before it attacks your stomach, just learn about all such abnormalities with a special focus on their causes, symptoms, preventive measures and treatment strategies before it is too late. Though some of the stomach conditions are usually very rare, there is large number of those that are very common. The major causes include malnutrition, over eating, excessive use of roasted food items and bad eating schedule. Too much consumption of fatty foods and alcoholic drinks can also prove to be very hazardous. Here follows a brief description of some of the most common stomach diseases. Sometimes, the lower esophageal sphincter opens, causing the acid produced in stomach to flow backwards into the esophagus. As a result, the individual experiences chest pain and heartburn. 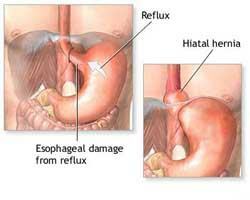 If the problem occurs too often, the condition is termed as gastroesophagael reflux disease. It is also shortly denoted as GERD. Over 15 million adults in the US experience heartburn on daily basis, while more than 60 million individuals face the same condition at least once a month. Feeling of a burning chest pain that begins behind the breastbone and spreads to throat and neck regions. Regurgitation of food from stomach into esophagus. The health care providers usually recommend changes in diet and lifestyle for the treatment of the disease. They advise the victims to avoid such foods and beverages which are likely to weaken the LES or lower esophageal sphincter. Also known as stomach ulcers or peptic ulcers, it is one of the serious diseases of stomach. It develops holes in the walls of the stomach due to an over secretion of the digestive acid, i.e. hydrochloric acid or HCL. 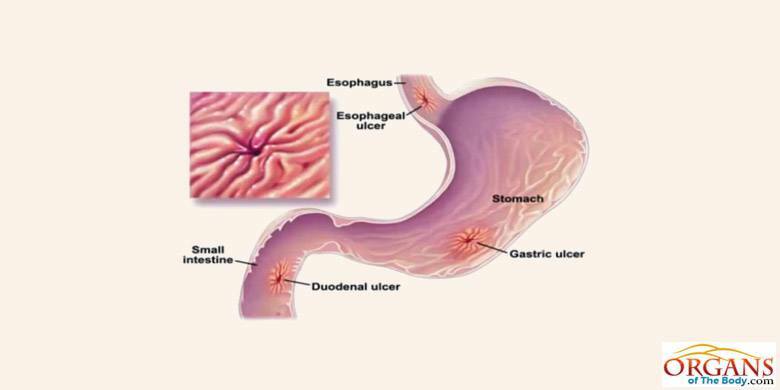 Moreover, an inappropriate diet, bacterial infections, frequent drinking and smoking can also contribute towards the development of gastric ulcers. Burning pain in the middle or upper part of stomach that occurs either at night or between the meals. Vomiting or urge to vomit. Black or dark color of stool due to bleeding. Severe pain in the abdominal region. Development of hole through the stomach wall. 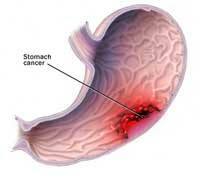 The peptic ulcers should to be treated timely or else the victim would have to face serious health problems. The mild cases can be treated by bringing appropriate changes in the lifestyles while the severe cases require medications or surgery. PPI or Proton Pump Inhibitors are used to reduce the levels of acid in the stomach, so that the ulcers could be healed. Commonly known as stomach cancer, it is another of the deadly stomach disorders, and is caused by exposure to carcinogens or cancer causing agents. This disease is characterized by the abnormal division of stomach cells, resulting in the development of malignant tumors.This dangerous disease has a slow growth and may take several years to reach maturity. Sensation of burning and pain in the chest region. Pain in stomach and bloody stools. Bloated feeling and difficulty in swallowing. Feeling of tiredness and weakness. Yellowing of skin and eyes. After diagnosis through blood tests, upper endoscopy, CT scan and biopsy, your health care provider would recommend an effective treatment measure. The choice of treatment method also depends on the patient’s history. The common methods applied for its cure include chemotherapy, radiation, chemoradiation, drug administration and surgery, etc. It is more commonly known as indigestion. Dyspepsia can be caused due to a number of factors, including bacterial infection, over-eating and a high intake of junk food. Common symptoms include bloating, nausea, vomiting, acid reflux and abdominal pain. Discomfort or pain in belly. Bloating and uncomfortable feeling of fullness after meals. Regurgitation of food or liquid. Dietary changes and modification in lifestyle are usually helpful in eliminating the symptoms of this disorder. The physicians advise the patients to avoid smoking, chewing tobacco and lying down immediately after eating. Losing weight can also be helpful. Wearing tight clothing around the middle should be avoided. Normally a human being gets 1 stool per day which shows that the stomach is working fine but if a person is having less than three stools per week,the condition is known as constipation. The movement of food in colon becomes slower than the normal which causes such stomach problems. Straining or facing difficulty in bowel movements. Swelling and pain in the abdominal area. As the insufficient intake of water and fiber lead to constipation, the patients are advised to take two to four extra glasses of water daily add fruits and vegetables to their diet. Taking warm fluids in the morning time can also be helpful. If condition persists, physicians may recommend the use of mild laxatives or stool softeners.